Some of the t-shirts from earlier collections had metal logo tags connected to a couple chain links and sewn into the shirt, instead of the silver fabric label. This is an example of the tag. I have not seen any of these faked yet. 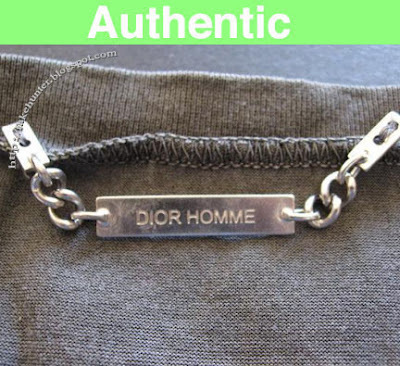 It is much cheaper for the counterfeiters to stick with the fabric labels rather than producing the metal ones... cheaper for Dior too, which is why they switched (to cut production costs). But still be on the lookout! As you can see above, the fake tag is slightly longer than the authentic one, and the text is slightly larger. Furthermore, the fake text looks like it was stamped into the metal, whereas the authentic looks like it is engraved into the metal (note the sharper edges). The The fake also has an extra link or two in the chain.